Join us in a Different Season! sun dog over the BMD fishhuts! Deer Beds, and Deer in Beds. deer bed, under the tree between Cedars and Clover cottage. These are deer beds. These are where the deer bed down for the night. These are right outside the door of Clover cottage. And these are deer. In beds... Enjoying the sun today, right in front of my cottage. They are here every day. They come to raid the bird feeder at the house, and hang out near Clover cottage, making for wonderful photo opportunities! on the lake, at the end of Clover's dock. Check out their path beaten in across the bay. Last week, some of our guests came across a wolf-kill near one of our ski/snowshoe trails, up on top of Hemlock Bluff. There was not much left -- one thing for sure, when a pack of wolves take down a deer, they don't waste any of it. Later that week, the same guests saw wolves trot across our frozen lake. And then they spotted the Bald Eagle, who was visiting another kill-site out on the lake past our bay. A few days ago, out walking with Taffy and Megan, we came across signs of a scuffle, much closer to home. Along the trail next to Springside cottage there were clumps of deer fur, tracks going every which way, both deer and wolf. And then, nothing. The deer escaped, the wolf went hungry. But the tale written in the snow was fascinating. Stay with us, check out what's wild about us, and then hop over to the Park, just ten minutes away, and see what else is happening in the 'hood. you can read the story from the traacks in the snow! And then and come check us out, here at Bondi Village. We're wild about our place -- just ten minutes from Algonquin, 20 to the Ice Trail at Arrowhead, we are just steps away from the deer who come daily to visit. And the local wolf pack leave their tracks all over the place. Ski our silent woods and restore your faith in the world. Snowshoe through fields and forests that are white and still... Pull out your camera to get great photos of our wildlife and birds. Visit with our horses and hens. Just come find yourself again. an Update on the ASC trails, fresh today. Dug out the Drag Today. Hooked up the Drag today and did Trail D101B from 76 then back to Dwight then back on D101B up to Oxbow. Its -14C and they should set up nicely. Every year I'm so thankful for the Excelent re-design that Garry Evans from Tall Pines did on our Drag. It works flawlessly. The packer pad he designed and built for us and Tall Pines works great also. The Guy is a Genius. We didn't change the status of our trails this week as there are still a few wet spots and the other trails we packed will need another pass on them to be able to open. We have All heard the term "Short Term Pain for Long Term Gain". Well last year we lost the use of our part of Trail 65 due to logging. I'm happy to say we will benefit from the logging roads they built and will have a new 12.7km awesome trail. It had been packed once and will need to be signed and groomed 1 more time, GPS the route so it can go on the OFSC Interactive Trail Guide. Hope to be able to get to it next. A huge Thanks to Kent and his brother Bruce for the help linking the trail and Kent riding shotgun packing it. It was a long day. Next week if the cold temps hold I plan to get to the west side of Dwight on 77-78-79 to get them packed. There are plenty of wet spots on those trails and I see there is sled traffic on them so that should help put some frost into the ground. Just a heads up as we open the remaining trails, the existing open trails won't be groomed that day. We will try to open 1 day and groom the open trails the other day so they don't get out of hand. That's it for now. Good night from Oxtongue Lake. If you no longer wish to receive these updates you can unsubscribe or send me an email at tim.drouin@gmail.com. If you know of anyone else that would like to get these updates let me know. Remember you can purchase your ASC Club Membership online using PayPal http://www.algonquin-sc.on.ca/webcam.html or at any of our events. We have Snow. And Today, some Sun! Sun shining through the icicles! 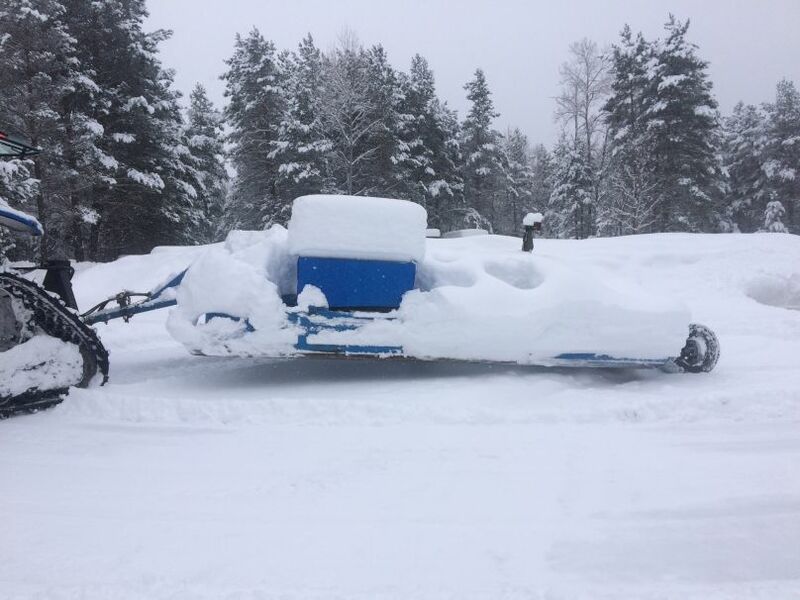 plenty of deer tracks, the ski trail groomer at rest, and lots of snow. it's a little dark, but there are deer under the big pine tree, right in front of Wheelhouse! and wildlife. The group of guests here from the Ancient Mariners' Canoe club last week came across the remains of a deer killed by wolves on top of the hemlock bluff. The next day they saw the wolves trot across our bay. Three deer came right up to the door of their cottage. And then they spotted the bald eagle, coming in to another wolf kill site on the lake. Despite the mild week, we still have decent conditions -- ideal for snowshoeing actually! I didn't post this week because I was here, there, everywhere -- including a trip to Guelph on Thursday to bring my horse home from the Ontario Vet College... I note that there is NO snow in Guelph. Just gray, brown and slushy vistas. Come north, it's better here. Guests this week found a deer kill near one of our trails -- the wolves had left almost nothing behind. The following day, they saw the wolves trotting across the lake. Pretty exciting! So yes, we have snow... come north and enjoy it! And after a day out on the trails, the fun moves indoors as they feast and laugh together. It is always a joy to host groups like this. With our 20 k of ski/snowshoe trails, there are plenty of places to go to 'make tracks'. Dave and Megan sanding after the storm last week. We may be doing it again, tomorrow! We prefer the Snow Dance, where everyone joins hands and chants: Ice and Rain, we just say NO! What we want is Fluffy Snow! Last night's Wolf Moon over Sunflower cottage. Why not come spend time with our peace and quiet? One of our guest, Yaara, has made this amazing image of the Wolf Moon. Now, that is a snowbank! The Ice Trail at Arrowhead has made it to the list of the top ten in the WORLD. Come on up, stay with us, enjoy the peace and quiet of our 600 acres of wilderness, then take int he Skate Trail, and then dive into some of the local cuisine. Come play in our snow! Some dig in. Some build up.